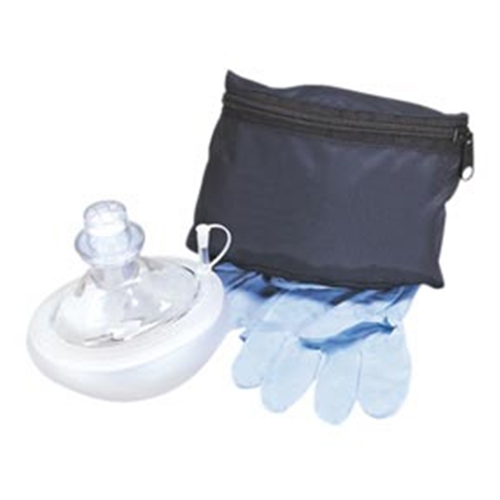 CPR Micromask from HealthyKin.com was specifically designed to set the standard in the industry, the CPR MICROMASK features a positive, one-way, non-rebreathing valve complete with filter. This valve has a large opening to reduce restrictive rescue breathing.The CPR Micromask is made of materials which remain flexible over a wide range of temperatures, allowing it to conform to facial contours and provide an outstanding seal, even under extreme conditions. The CPR Micromask dome is manufactured from clear plastic for accurate patient monitoring. It may be used on adults, children and infants.The ever popular fold-down styling makes for a low profile, easily accessible package that includes a pair of nitrile gloves in a durable nylon belt pouch. The CPR Micromask is reusable with a single use disposable one-way valve. The CPR Micromask has a removable/disposable filtered valve that allows the professional rescuer to be prepared to give CPR efficiently. The CPR Micromask features a cushion inflation tube allowing the rescuer to adjust the cushion to the desired shape and firmness. Functioning at a wide range of temperature or altitude extremes, the adjustable cushion helps achieve a positive seal on adults, children or infants. Zippered pouch has a belt loop allowing the rescuer to wear the CPR Micromask. Disposable nitrile gloves are included.